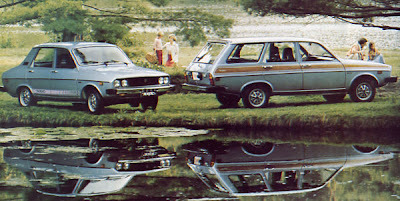 The 1979 Renault 12 Nordic sedan listed for $6,645 and the Estate Wagon for $6,645 f.o.b. Toronto. The unique Nordic edition was available only in Canada and Scandinavian countries. Few automotive names are as revered in France as that of Renault. This is the car immortalized in history books because of the role it played in saving Paris from Kaiser Wilhelm’s army during World War One. Drivers rushed soldiers to the front in their Renault taxicabs so they could engage the German army in combat. Quick thinking cab drivers and the fast cars saved the day and Paris, too. Renault solidified its reputation as a manufacturer of quality cars between the wars. Its products were innovative and rugged. They were exported throughout much of the world. When the Germans invaded France in 1940, Louis Renault continued to build vehicles. After the liberation of France, Louis Renault was arrested and charged with aiding the Nazis because he continued to build cars during the German occupation. The pioneer automaker died in prison in 1944. The government nationalized his automaking concern. Renault returned to manufacture of civilian products in February 1945. Renault began exporting cars to Canada in 1959. The product was certainly adorable; the delightful Dauphine with its rear engine was an easy sell throughout the Dominion. Racking up 5,652 sales in calendar year 1960, Renault captured 1.28 percent of the domestic market for itself—handily outselling eight long established domestic nameplates. Sales were sufficient to warrant the opening of an assembly plant outside of Montreal in November of 1965. Deadly rivals in their home market, Renault and Peugeot joined forces in Canada. The two marques' passenger cars began rolling off the lines in St. Bruno, Quebec bound for the driveways and garages of Canadians from coast to coast. The high cost of the French Franc would be the main culprit for the plant’s closure in 1973. Though the factory was shuttered, Renault continued to ply its wares in Canada. Records show that roughly half the company’s Canadian sales were to Quebeckers. Folks in British Columbia were second, eager to sign on the dotted line for the reliable Renault. 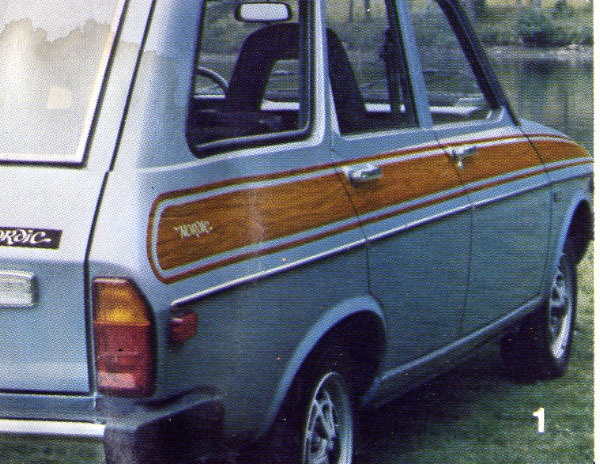 The Renault 12 bowed to Canadians in 1970. In its first year on our shores, the sleek car sold 2,392 units. Handwritten records prepared by the late Maurice Ferty, president of Renault Canada, show sales jumped to 4,750 units delivered in 1971 and rose again to 5,139 units in 1972 before dipping to 4,473 sales in 1973. A total of 3,435 units were delivered in 1974 and that dropped to 2,542 in 1975. Sales slid to 1,516 for the Renault 12 in the 1976 calendar year and even further in 1977 as the venerable model recorded only 1,179 sales in Canada. In 1978 Renault decided to create a special package for its popular, if now very familiar 12 models. The front-wheel drive cars with thier advanced rack-and-pinion steering would be marketed in Denmark, Finland, Sweden, Norway, Iceland and Canada. Since these nations all shared similar climatic conditions the packaging theme was a wise one. The Nordic was given a 1400-cc cast-iron mill with a light-alloy cylinder head. This engine developed 66.5 horsepower and was available only in the Swedish and Canadian models. The floor-mounted four-speed manual transmission was standard. That powertrain combo promised to deliver 6.7 litres per 100 kilometres (42 miles to the Imperial gallon). 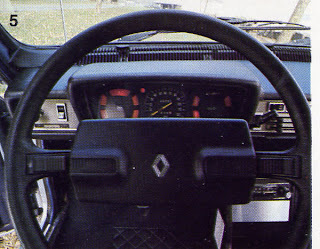 Instrument panel of the 1979 Renault 12 is space age in look and extremely functional. Bodies were given aluminum inner fenders—first developed by Renault for its Finnish market, mud flaps and special Double Rust Inhibition--an anti-corrosion treatment— employed in boxed in areas under the chassis. An electric rear window heater-defroster was made standard equipment. 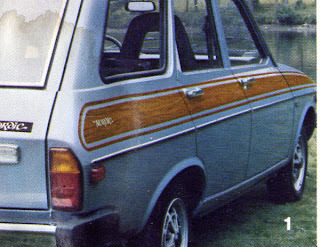 A rear window washer-wiper was given to the station wagon. All Renault 12 Nordics carried the Regie’s two-year/40,000-kilometre warranty that covered the entire car for the first 12 months or 20,000 kilometres and then labour and parts for drivetrain defects the second year. The Nordic was appointed with a number of unexpected niceties. A centre armrest on sedans and a centre console up front were nice touches. Carpeting throughout the cabin was colour-keyed to coordinate with the exterior. A luggage compartment mat was practical, a cigarette lighter useful, a light in the sedan’s trunk was thoughtful and integrated hollow head rests were smart as well as stylish. Exterior colours were all metallic paint and enhanced with special Nordic pinstripes and decals. Each one leaving the factory boasted Gordini type sport wheels mated to a set of steel-belted radial tires. The sedan sold for $5,465 and the wagon for $5,865, f.o.b. Montreal. There were few options for the special edition Renault. One was a neat headlamp washer that shot “powerful jets of cleansing liquid” onto the headlights. A three-speed automatic transmission was another. An AM/FM radio, a roof rack for the wagon and a wind deflector rounded out the short list. Advertising boasted that nearly 25,000 Renault 12s had already been purchased by Canadians. It is not known how many 12s or specially trimmed Nordic 12s were delivered to domestically in 1978 but total domestic Renault sales that calendar year amounted to 6,256 units. Records show that only 654 Renault 12 models were sold throughout this country in calendar year 1979, all of them wearing the Nordic trim. With Renault getting hitched to American Motors, the company moved its head office from Montreal to Brampton, Ontario that year. Things were winding down for the Renault 12; only 225 units sold in 1980 and in its last year on the market, only 37 Renault 12s found home with Canadians. The Renault 12 was with us for 12 seasons and the Nordic is one of its most interesting variants. Yes, they are. I've enjoyed more than Renault myself. My favourites are the 12 and my little Renault Cinq.